Join the American Space Leipzig for a roundtable discussion on innovation and success in the tech industry with Gideon Marks, Anchor Mentor at Google Launchpad Accelerator and Board Advisor at GlobeKeeper. Gideon Marks has been active in high tech for 30 plus years in growth companies from inception through initial public offering and in M&A transactions. Working with many entrepreneurs from Europe, Korea, Israel, and Silicon Valley led Gideon to share his experience with what makes startups more successful than others and what is needed as far as leadership, traction, funding, and technology. In his talk he will focus on topics such as: doing the right things, telling a good story to investors, numbers have to add up, finding the right investors, building credibility. 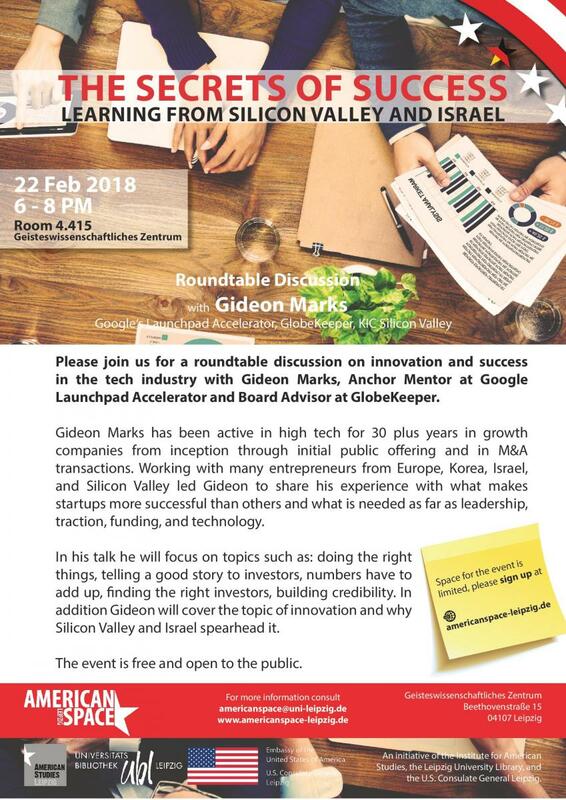 In addition Gideon will cover the topic of innovation and why Silicon Valley and Israel spearhead it.